Life has dealt me a few twists and turns over the years but I’m now settled and nestled in our home on a blustery North Eastern English hill. 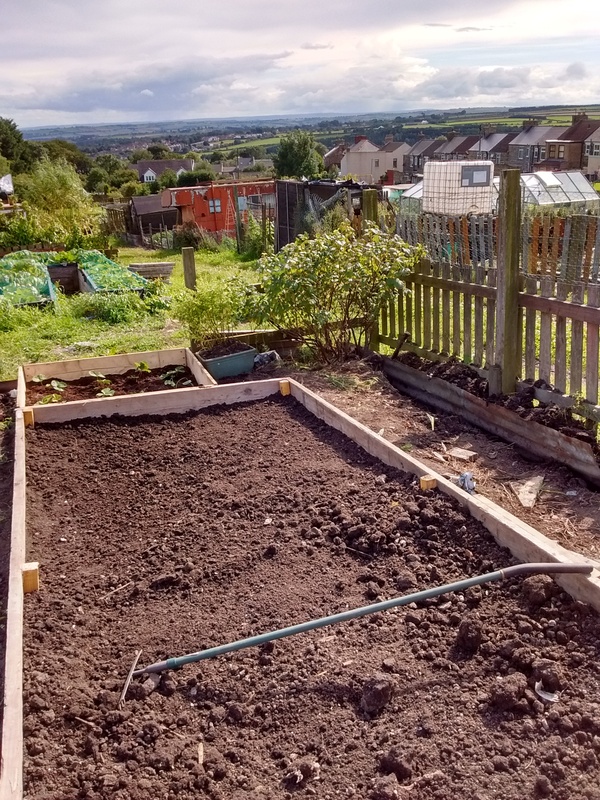 A couple of weeks ago I was given the go-ahead to begin clearing quite a scruffy and unloved small allotment plot sited at the back of our house. The previous plot holder still has access to the greenhouse and the bed to the right that has potatoes and onions growing so I can’t move in properly as yet. I can make the rest my own though. I’ve started to clear from the far left where the black current bush is. The black currents have been harvested and are in the freezer. The bush has now been pruned by a third. I’ve cleared the sidings where I plan to accompany the black current with red and white current bushes with fruit tree cordons taking up residence towards the right. The strawberry bed is in and that bed that is bare is the first of 4 raised beds that will be rotated on a 4 year basis. It will be the brassica bed this year as I have turnip, spring cabbage, Swiss chard and spring greens seedlings to transplant. I’d like to share all I get up to on the plot. I’m a novice allotmenteer trying to play with the elements at around 900 feet above sea level. I’m also quite a savvy minded housewife and plan to garden as naturally and as cheaply as I can so I will be blogging about my experiments, my money saving ideas, my storing produce attempts on my small home and my scratch cooking with the food I can produce. Thank you for reading to the end. I hope to have some company along the way and, as I’m learning, hopefully some advice too. Until the next time, please wish me growers luck. Thank you so much for your visit and I see your follow.. Many thanks.. I comment using my main blog as I do not get updates in replies to my second blog which is Dreamwalker’s Garden. So Hope I do not confuse you..
Ps the link to my garden blog is found on my my site on the right hand side bar, just click the photo link and it will take you to my garden blog if you get lost in Dreamwalker’s Sanctuary..